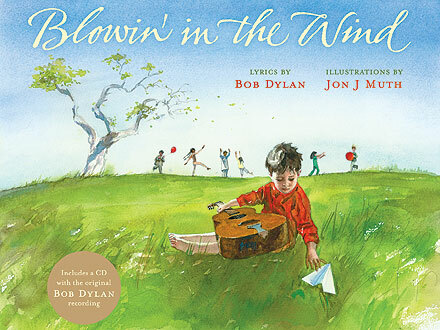 Blowin’ in the Wind (2011) is an inspiring picture book based on the famous Bob Dylan song originally written in the 60s. The lyrics are accompanied by Jon J. Muth‘s paintings and includes a cd for kids and parents to sing along… and let their imagination drift with the winds that whisper a kinder destination. This book was a gift from my aunt Silvia Prado Mutarelli and her crew of boys. She used to own the bookstore Klaxon with my mom, went on to create an amazing children’s store called Fábrica de Brinquedos (Toys Factory), now lives on a beautiful island and continues to be a kids, books, plays, and music enthusiast.